"Beats per minute" redirects here. It is not to be confused with Beats Per Minute (website). In musical terminology, tempo [ˈtɛmpo] ("time" in Italian; plural: tempi [ˈtɛmpi]) is the speed or pace of a given piece or subsection thereof, how fast or slow. Tempo is related to meter and is usually measured by beats per minute, with the beats being a division of the measures, though tempo is often indicated by terms which have acquired standard ranges of beats per minute or assumed by convention without indication. Tempo may be separated from articulation, or articulation may be indicated along with tempo, and tempo contributes to the overall texture. While the ability to hold a steady tempo is a desirable skill, tempo is changeable, and often indicated by a conductor or drummer. 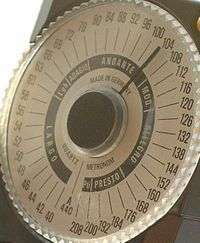 While practicing, an electronic or mechanical device, a metronome, may indicate the tempo, as one usually works one's way up to being able to perform at the proper tempo. In other words it is the speed at which a passage of music is or should be played. A piece of music's tempo is typically written at the start of the score, and in modern Western music is usually indicated in beats per minute (bpm). This means that a particular note value (for example, a quarter note, or crotchet) is specified as the beat, and that the amount of time between successive beats is a specified fraction of a minute. The greater the number of beats per minute, the smaller the amount of time between successive beats, and thus faster a piece must be played. For example, a tempo of 60 beats per minute signifies one beat per second, while a tempo of 120 beats per minute is twice as rapid, signifying one beat every 0.5 seconds. Mathematical tempo markings of this kind became increasingly popular during the first half of the 19th century, after the metronome had been invented by Johann Nepomuk Maelzel, although early metronomes were somewhat inconsistent. Beethoven was one of the first composers to use the metronome; in the 1810s he published metronomic indications for the eight symphonies he had composed up to that time. Instead of beats per minute, some 20th-century composers (e.g., Béla Bartók, Alberto Ginastera, and John Cage) specify the total playing time for a piece, from which the performer can derive tempo. Some musical pieces do not have a mathematical time indication. In classical music it is customary to describe the tempo of a piece by one or more words. Most of these words are Italian, because many of the most important composers of the 17th century were Italian, and this period was when tempo indications were first used extensively and codified. Before the metronome, it was difficult to specify the tempo of a composition; attempts were made using pendulums or the human pulse. Yet, after the metronome's invention, musicians continued to use these words, often additionally indicating the mood of the piece. This blurred the traditional distinction between tempo and mood indicators. For example, presto and allegro both indicate a speedy execution (presto being faster), but allegro also connotes joy (from its original meaning in Italian). Presto, on the other hand, simply indicates speed. Additional Italian words also indicate tempo and mood. For example, the "agitato" in the Allegro agitato of the last movement of George Gershwin's piano concerto in F has both a tempo indication (undoubtedly faster than a usual Allegro) and a mood indication ("agitated"). In some cases (quite often up to the end of the Baroque period), the conventions that governed musical composition were so strong that composers didn't need to indicate tempo. For example, the first movement of Bach's Brandenburg Concerto No. 3 has no tempo or mood indication whatsoever. To provide movement names, publishers of recordings resort to ad hoc measures, for instance marking the Brandenburg movement "Allegro", "(Allegro)", "(Without indication)", and so on. In Renaissance music, performers understood most music to flow at a tempo defined by the tactus (roughly the rate of the human heartbeat). The mensural time signature indicated which note value corresponded to the tactus. Often a particular musical form or genre implies its own tempo, so composers need place no further explanation in the score. Thus, musicians expect a minuet to be at a fairly stately tempo, slower than a Viennese waltz; a perpetuum mobile quite fast, and so on. Genres imply tempos. Thus, Ludwig van Beethoven wrote "In tempo d'un Menuetto" over the first movement of his Piano Sonata Op. 54, though that movement is not a minuet. Popular music charts use terms such as bossa nova, ballad, and Latin rock in much the same way. Note that not only did tempos change over historical time and even in different places, but sometimes even the ordering of terms changed. For example, a modern largo is slower than an adagio, but in the Baroque period it was faster. 2 would show a minim (or half note). 8, therefore use a dotted quarter note to indicate their bpm. Exotic time and particularly slow time signatures may indicate their bpm tempo using other note durations. bpm became common terminology in disco because of its usefulness to DJs, and remain important in the same genre and other dance music. In this context the beats measured are either quarter notes in the time signature (sometimes ambiguously called down-beats), or drum beats (typically bass-drum or another functionally similar synthesized sound), whichever is more frequent. Higher bpm values are therefore achievable by increasing the number of drum beats, without increasing the tempo of the music. House music is faster around 120–128 bpm (from regular house music to UK garage), trance music ranges from 125 to 150 bpm, and drum and bass generally ranges between 150–180 bpm. Psytrance is almost exclusively produced at 145 bpm, whereas Gabber can exceed 180–220 bpm. Speedcore can exceed 200 -1000+ bpm. More extreme tempos are achievable at the same underlying tempo with very fast drum patterns, often expressed as drum rolls. Such compositions often exhibit a much slower underlying tempo, but may increase the tempo by adding additional percussive beats. Extreme music subgenres such as speedcore and grindcore often strive to reach unusually fast tempos. The use of extreme tempo was very common in the fast bebop jazz from the 1940s and 1950s. A common jazz tune such as "Cherokee" was often performed at quarter note equal to or sometimes exceeding 368 bpm. Some of Charlie Parker's famous tunes ("Bebop", "Shaw Nuff") have been performed at 380 bpm plus. John Coltrane's "Giant Steps" was performed at 374 bpm. Beat-matching is a technique DJs use that involves speeding up or slowing down a record to match the tempo of a previous track so both can be seamlessly mixed. DJs often beatmatch the underlying tempos of recordings, rather than their strict bpm value suggested by the kick drum, particularly when dealing with high tempo tracks. A 240 bpm track, for example, matches the beat of a 120 bpm track without slowing down or speeding up, because both have an underlying tempo of 120 quarter notes per minute. Thus, some soul music (around 75–90 bpm) mixes well with a drum and bass beat (from 150–185 bpm). When speeding up or slowing down a record on a turntable, the pitch and tempo of a track are linked: spinning a disc 10% faster makes both pitch and tempo 10% higher. Software processing to change the pitch without changing the tempo, or vice versa, is called time-stretching or pitch-shifting. While it works fairly well for small adjustments (± 20%), the result can be noisy and unmusical for larger changes. "Andante" redirects here. For other uses, see Andante (disambiguation). "Vivace" redirects here. For other uses, see Vivace (disambiguation). non troppo – not too much, e.g. allegro non troppo (or allegro ma non troppo) means "fast, but not too much"
Tranquillamente – adverb of tranquillo, "calmly"
Although Italian has been the prevalent language for tempo markings throughout most of classical music history, many composers have written tempo indications in their own language. This section lists tempo markings from in the Harvard Dictionary of Music or the online foreign language dictionaries listed in Sources. English indications, for example quickly, have also been used, by Benjamin Britten and Percy Grainger, among many others. In jazz and popular music charts, terms like "fast", "laid back", "steady rock", "medium", "medium-up", "ballad", "brisk", "up", "slowly", and similar style indications may appear. Tom Lehrer's anthology Too Many Songs by Tom Lehrer, uses fake English tempo markings to humorous effect. For example, Lehrer specifies that the song National Brotherhood Week should be played "fraternally," We Will All Go Together be played "eschatologically," and Masochism Tango be played "painstakingly." Some such movements may start to lead a life of their own, and become known with the tempo/mood marker name, for instance the string orchestra version of the second movement of Barber's first string quartet became known as Adagio for Strings. A similar example is the Adagietto from Mahler's Symphony No. 5. Sometimes the link between a musical composition with a "tempo" name and a separate movement of a composition is less clear. For instance, Albinoni's Adagio is a 20th-century creative "reconstruction" based on an incomplete manuscript. ↑ Some of these markings are today contentious, such as those on his "Hammerklavier" Sonata and Ninth Symphony, seeming to many to be almost impossibly fast, as is also the case for many of the works of Schumann. See "metronome" entry in Apel (1969), p. 523. ↑ Haar, James. The Science and Art of Renaissance Music. Princeton University Press. p. 408. ISBN 1-40-086471-2. ↑ Snoman (2009), p. 251. ↑ William E. Caplin; James Hepokoski; James Webster (2010). Musical Form, Forms & Formenlehre: Three Methodological Reflections. Leuven University Press. p. 80. ISBN 905-867-822-9. ↑ Apel (1969), p. 42; for the literal translation see the online Italian–English dictionary at WordReference.com. ↑ "Istesso tempo" entry in Sadie (2001). ↑ For a modern example of L'istesso, see measures 4 and 130 of Star Wars: Main Title, Williams (1997), pp. 3 and 30. ↑ Apel (1969), p. 505. ↑ Apel (1969), p. 834. ↑ Apel (1969), p. 61. ↑ Online Italian–English dictionary at WordReference.com. ↑ Apel (1969), p. 112. ↑ Apel (1969), p. 334. ↑ Apel (1969), p. 520. ↑ Apel (1969), p. 537. ↑ Apel (1969), p. 680. ↑ Apel (1969), p. 683. ↑ Apel (1969), p. 763. ↑ "Brillante" entry in Sadie (2001). ↑ "Bravura" entry in Sadie (2001). ↑ "Ritenuto" entry in Sadie (2001). ↑ Apel (1969), p. 809. ↑ Apel (1969), p. 92. ↑ Italian translation, WordReference.com; German, Apel (1969). ↑ Heyman, Barbara B. (1994-05-12). Samuel Barber: the composer and his music. Oxford University Press. p. 158. ISBN 0-19-509058-6.